Originating In Belgium but popular in France and Northern Europe Moules Frites or Mussels with chips truly is a dish I could scoff at for hours. Tasty mussels with a sauce that begs for bread and with a side of chips? Carbs and carbs? Yes m’am! Whilst I rarely eat them these days (it’s been a while between me and a Belgium Beer Cafe) I saw nags on mussels on special at Harris Farm the other week and knew it would be the perfect Saturday night dinner for Rob and I. You can buy the mussels in those 1kg bags that have been pre-washed and de-bearded) or buy them from your local fish market. Mussels should be dark and shiny and smell like the ocean (not fishy). 1. Cut your potatoes roughly into chip sizes and add into a hot oven until golden brown. I leave the skins on because I’m lazy and like the flavour. 4. Add the mussels to the pot and cover for a few minutes. Open the lid and if the shells have opened up you are done (literally takes about 2-3 minutes) take off the heat and serve immediately. I finely chop some parsley to add on top too. 5. I serve these ladled into a big bowl each with lots of liquid and as many shells as you can fit. Make sure there’s a bowl for the empty shells, some bread and the chips on the side. Mayo also required for the chips (my Flemish friend would say this is essential). It’s messy as you slurp the mussels out (you can use an empty shell as a pincer to remove the others) and I use the empty shells and a spoon to ladle the sauce out. Dip the bread in, dip the chips in…just go for it! If any of the mussels don’t open…don’t try and open them it usually means that they are no good so just throw them out. Cut your potatoes roughly into chip sizes and add into a hot oven until golden brown. I leave the skins on because I'm lazy and like the flavour. Add the mussels to the pot and cover for a few minutes. Open the lid and if the shells have opened up you are done (literally takes about 2-3 minutes) take off the heat and serve immediately. I finely chop some parsley to add on top too. I serve these ladled into a big bowl each with lots of liquid and as many shells as you can fit. Make sure there's a bowl for the empty shells, some bread and the chips on the side. Mayo also required for the chips (my Flemish friend would say this is essential). It's messy as you slurp the mussels out (you can use an empty shell as a pincer to remove the others) and I use the empty shells and a spoon to ladle the sauce out. Dip the bread in, dip the chips in...just go for it! Note: any unopened mussels can be thrown away it usually means they are no good if they don't open up. You can eat these with a dash of cream as well if you’d like it a little richer…any which way I know you’ll love them! Oh my goodness this sounds amazing!! What away to spend a cold winter night. I am thinking a trip to my the fish market could be necessary. Enjoy! 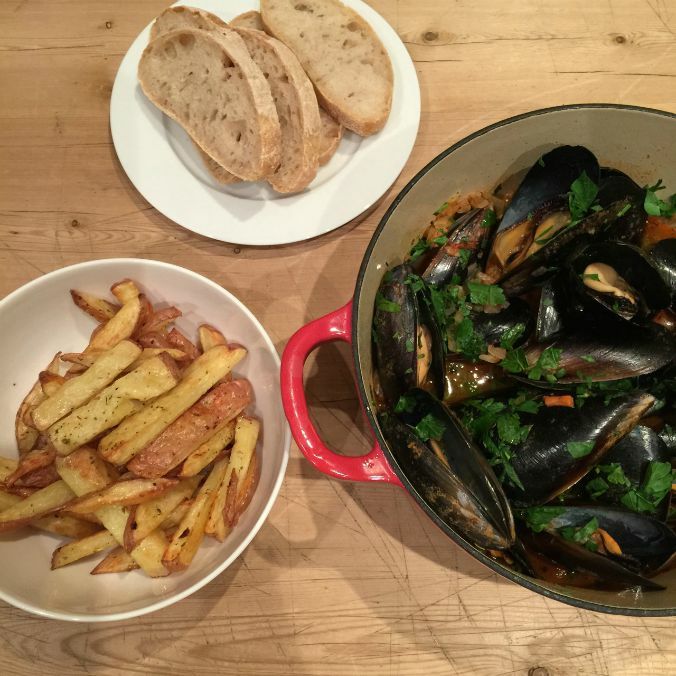 I’m not a fan of mussels but I’d give them another try Beth the frites look yummy! I’m vegetarian now but this took me straight back to the few years I spent in Belgium. So simple and so tasty. Had to laugh at the mayonnaise comment – frites without Mayo – unthinkable! Oh one of my all-time favourite dishes! I had some delicious mussels in a pub on the west coast of Ireland recently, oh my word, they were a delight. Perhaps the best meal I had in almost four weeks away. I’m now thinking I’m going to have to do this next weekend. This looks delish and will be cooked in our house next Saturday night – though I’m not sure I can wait that long! I pretty much go with the same recipe when my husband asks if we can make ‘that mussel dish’ however I add in a finely sliced red chilli (without seeds) at the same time as the garlic and onion and at the end just before serving I use basil leaves instead of parsley. I also add in some green prawns just before the mussels if I’m feeling extra fancy. Oh so yummo. Never had this dish with the chips though, just crusty bread, will have to give that a shot next time. Sounds relish! Just salt and pepper and maybe some dried herbs on those chips – that’s it!